WEST LAFAYETTE, Ind., Jan. 14, 2015 — Nanodiamonds containing atomic-scale defects can enhance metamaterials’ emission of single photons — an important attribute of future quantum computers. A team at Purdue University, in cooperation with Russian researchers, coupled nanodiamonds with nitrogen vacancy centers with a metamaterial lattice made of titanium nitride (TiN) and aluminum scandium nitride (AlxSc1-xN). The metamaterial is pumped by a laser. Nanodiamonds have been added to the surface of a hyperbolic metamaterial to enhance the production of single photons, a step toward quantum computers and communications technologies. Courtesy of the Birck Nanotechnology Center at Purdue University. A nitrogen vacancy center is an atomic-scale defect formed in the diamond lattice by substituting a nitrogen atom for a carbon atom. 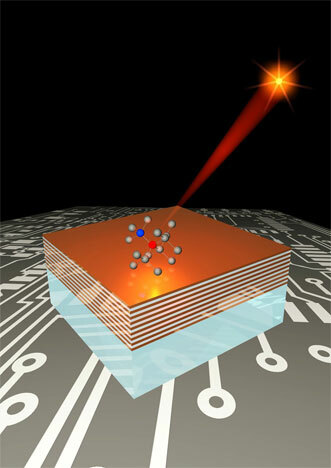 Placing a nanodiamond containing an NV center on the surface of hyperbolic metamaterials not only enhances the emission of photons, but also changes the pattern of light emitted, a trait that could be important for the development of quantum devices. Nitrogen vacancies may also play a role in data storage because information may be encoded in nuclear or electron spin state of the center. Future research may include work to improve the system with devices that combine the hyperbolic metamaterial with nanoantennas and optical waveguides to increase its efficiency and make it more compact. The research was published in Laser & Photonics Reviews (doi: 10.1002/lpor.201400185).